The unadjusted gender pay gap (GPG), according to Eurostat methodology, was 16.1% in the year 2016 and 17% in the previous year. The GPG was approximately 16% in the private sector and the central government but 8% in the local government where earnings are generally less distributed. The GPG is based on the difference of hourly earnings of men and women as a proportion of men’s hourly earnings. The hourly earnings include basic wages, regular bonuses and overtime payments. Looking at total monthly earnings, every fifth woman had total monthly income below 400 thousand ISK for full-time work in 2016. The same was true for every fourteenth man. Approximately 15% of men and 6% of women had monthly total earnings above one million ISK. 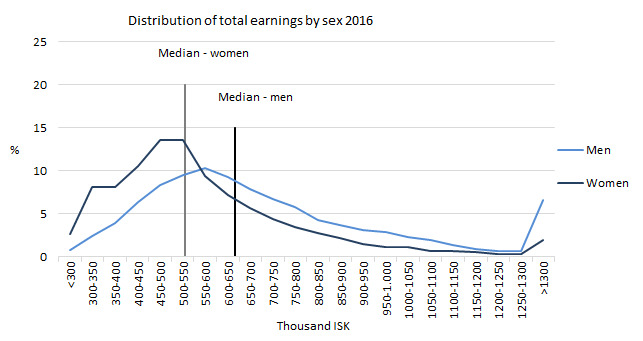 Half of women had total income below 525 thousand ISK but the median earnings for men were 643 thousand ISK. On average total earnings of women were 22% lower than total earnings of men in 2016. Total earnings of men were 742 thousand ISK on average and women’s total earnings were 582 thousand ISK on average. Working hours partly explain why men‘s mean total earnings were higher than women’s for full-time employees. According to the Icelandic Survey on Wages, Earnings and Labour Costs, the average number of paid monthly hours for men was 189.1 in 2016 and 179.7 for women. The gender pay gap was thus less when comparing basic earnings, where overtime pay is excluded, for full-time employees or 12% but 15% when comparing regular earnings without overtime pay but with regular bonuses. 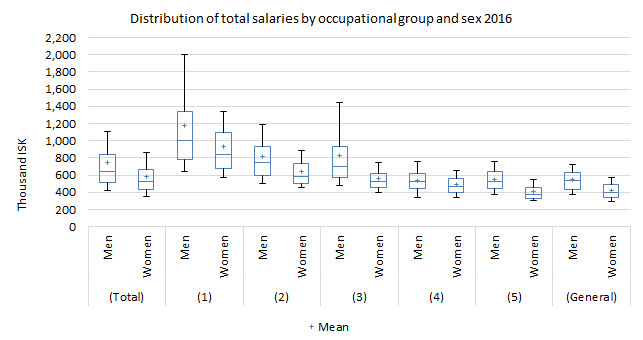 The mean and median of women’s earnings was lower than men’s in all occupational groups and the difference between the 1st and 10th deciles was wider for men than for women. Notes: The rectangle is defined by the lower and upper quartile and divided by the median. The bars are defined by the 1st and 9th decile. Managers (1), specialists (2), technicians (3), clerks (4), service workers (5), general workers (General). When comparing occupational groups it has to be kept in mind that occupations within the same group can vary greatly between the sexes. The most common occupation of women in the occupational group of specialists were primary education specialists, whereas it was most common for men to be business professionals. The mean and median of women’s earnings for full-time work was lower than men’s in all economic activities. The difference between the 1st and 10th deciles was wider for men in all instances except in the economic activity of Electricity and steam supply (D) and Public administration (O). The difference in the make up of economic activities has to be kept in mind when comparing data. For example, men and women held different occupations in the economic activity of Human health and socical activities (Q). About 14% of women in that economic activity were nursing professionals, 13% held some managerial positions, 7% were nursing associate professionals and 6% were medical doctors. On the other hand, 19% of men were medical doctors and the same proportion held a managerial position. Only about 2% of the men were nursing professionals and 1% were nursing associate professionals. Notes: The rectangle is defined by the lower and upper quartile and divided by the median. The bars are defined by the 1st and 9th decile. Manufacturing (C), Electricity, gas, steam, and air conditioning supply (D), Wholesale and retail trade; repair of motor vehicles (G), Transportation and storage (G), Information and communication (J), Financial and insurance activities (K), Public administration and defence; compulsory social security (O), Education (P), Human health and social work activities (Q). Earnings are based on the Icelandic Survey on Wages, Earnings and Labour Costs and cover about 70 thousand employees. The survey is a stratified sample survey of legal units with 10 or more employees and data are weighted according to the survey design. The survey covers about 80% of the Icelandic labour market even though certain economic activities are missing. Basic earnings are monthly remuneration for regular daytime working hours without any supplements. Regular earnings are monthly remuneration for regular working hours that is ordinary working hours according to collective agreements, both daytime and shift-work hours, including regular bonuses. Total earnings are the total remuneration per month, excluding payments in kind. The earnings’ gender pay gap is interpreted as the difference of mean men’s and women’s earnings as a proportion of men´s earnings. The unadjusted gender pay gap (GPG) is based on the Structure of earnings survey (SES). The gender pay gap in unadjusted form represents the difference between average gross hourly earnings of male employees and of female employees as a percentage of average gross hourly earnings of male employees. The calculation is based on October each year and gross hourly earnings include paid overtime and exclude non-regular payments. The gender pay gap indicator has been defined as unadjusted, i.e. 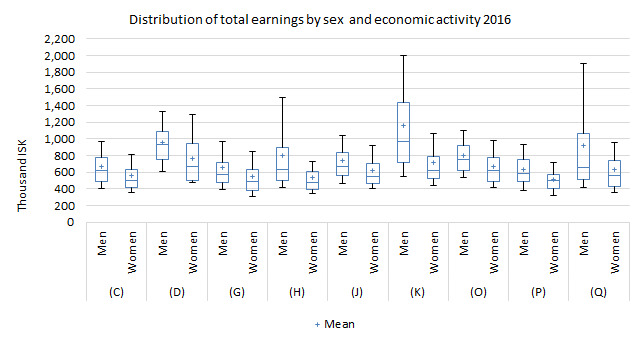 not adjusted according to individual characteristics that may explain differences in earnings for men and women.